Separate the basil leaves from the stems, wash them and dry them. Open the package of Pillsbury™ Crescents. Carefully remove the dough and extend on a clean surface. Use your fingers to align all the tips to prevent the cheese from coming out. Sprinkle the cheese and basil over the dough. Carefully roll up the dough, make sure it's rolled up tight enough. Wrap in wax paper then in plastic wrap or in the bag; make sure it’s sealed everywhere. Freeze for 10 minutes this will make it firm and easier to cut. After the ten minutes have passed, remove the roll from the freezer. Cut in half and then cut each half into 9 pieces. Place the rolls on the baking dish and bake as per the crescent package instructions; use the minimum time to be on the safe side. The rolls will be ready when they turn slightly brown. If you cant find shredded cheese with the peppers you can use your favorite shredded cheese and add pickled peppers, just make sure they're dry to prevent the roll from becoming moist. If you don't have basil, you can use parsley or cilantro. Though I highly recommend using basil. Summer is here and one of our favorite activities to enjoy during this season is going to the beach. My kids love going and can spend many hours playing in the water or on the sand; the only thing that distracts them is thirst or hunger, and I'm always prepared for that. I like to fill my picnic basket with beach food like granola bars, nuts, sandwiches or other easily prepared and served foods like the recipe I'm sharing with you today. 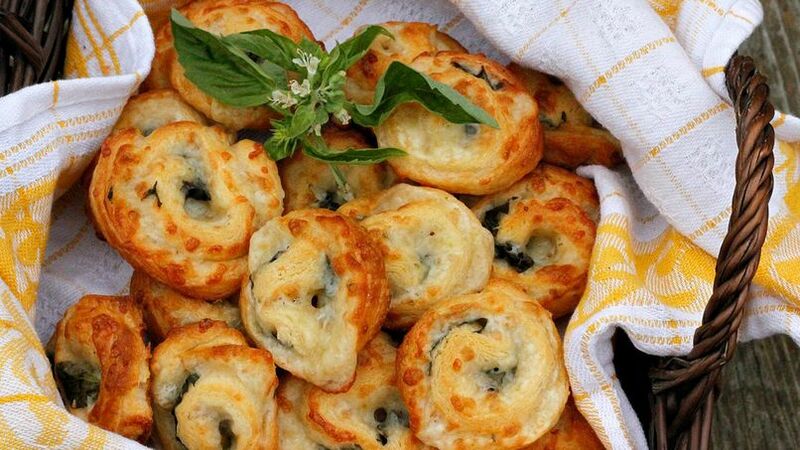 These cheese rolls are irresistible and I don't even need a plate to serve them, my kids just run up to me, grab one to quickly eat and go back to playing. If you don't live near a beach don't worry, these rolls are perfect for a picnic or a snack at home.